There is nothing like the flavors of ginger, cinnamon, and molasses at Christmas time. They are such warm, spicy flavors that pair nicely with a cup of eggnog and twinkling tree lights. Gingerbread cookies are usually hard, crunchy cookies, but I really prefer a soft and chewy texture. 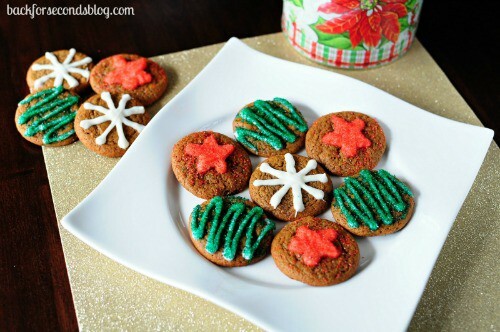 I used brown sugar and molasses to create that same festive flavor in a chewy cookie. They turned out incredibly well! I think they are my daughter and husband’s favorite cookies! The white chocolate and sprinkle decor on top is totally optional, as the cookies are delicious all on their own. It It sure adds a nice holiday touch though 😉 Enjoy! I love ’em soft too! Your decorations are so pretty! I love how you use white chocolate for decorating and then cover the white chocolate in sprinkles! This is perfect for so many different kinds of cookies! I totally agree with you! Soft gingersnaps are way better than the ones that ‘snap’! i’m a sucker for a chewy gingerbread cookie. Or any cookie with molasses inside. 🙂 Love the pretty white chocolate on top! remind me of my soft molasses cookies with the chips! Love these Stephanie! These are gorgeous! The perfect holiday treat! these look delicious. I have a link party called Wednesdays Adorned From Above Blog Hop and would love to have you share this with everyone. It runs from Wednesday through midnight Sunday. Here is the link to the party. 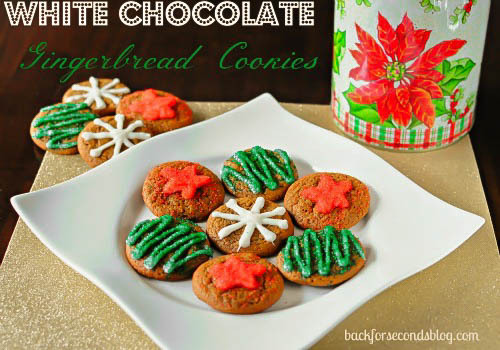 YUMMY these cookies sound delicious & they are so cute:) Thanks for sharing @ Whatcha Whipped Up.